Operating only two vessels but routinely rated among the top 20 best cruise ships in the world, Crystal Cruises have built a niche out of cruising in the western part of the United States. Known for high end luxury and surpassing passenger expectations is the standard operating procedure of Crystal Cruises and with each new trip another set of passengers gets to receive that treatment. The Bedding too was best. Created by Down Lite Inc. the 50/50 White goose pillows are designed to give that luxury hotel feel even when at sea. The luxury fill gives the right amount of loft and support while the white goose means premium soft comfort night after night. 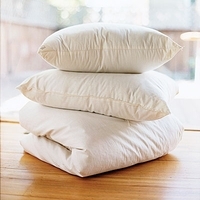 See what it takes to be the best with Down Lite's 50% White Goose Down 50% White Goose Feather Pillows tonight!